Feeling a little low on sleep? Overwhelmed with school and need a quick rest? Campus Center might have exactly what you need. Gone are the days when scuba diving adventures and luxurious spa visits were outside of the poor college student’s budget, thanks to a website called Groupon.com. Monday through Friday, Groupon puts up a coupon available for purchase. This is not just any coupon, though: it is a very high value coupon, often discounting an activity by 50% or more. Deals offered in the past have included deals on experiences such as $35 for a whale watching tour from Big Kahuna Tours, valued at $79; or $47 for a horseback trail ride at Hawaii Polo Club in Wailua, a $95 value. That leaves almost $50 to put into the bank and save, or perhaps, spend on another Groupon. Activity deals are not the only coupons the website offers. Every once in a while, a services are discounted tremendously as well. For example, a $495 teeth whitening treatment was on sale for only $179 in December 2010. Students on a super tight budget tired of dining primarily on ramen noodles and cans of spam especially have reason to rejoice. With the development of Groupon, they can break out of their monotonous and sodium-laden diets without breaking their budgets. Periodically, deals on restaurants are offered as well, like in December 2010. 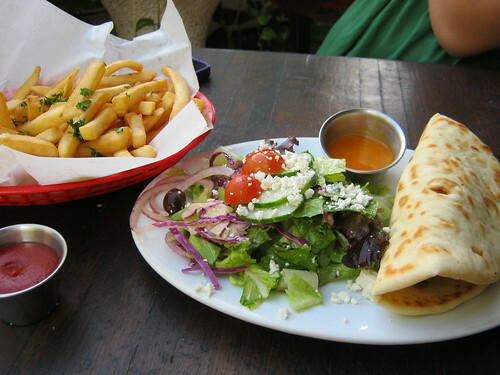 $25 worth of eats from The Fat Greek, an infamous college student restaurant pick with delicious Greek grub, was on sale for more than half off at a modest $12. 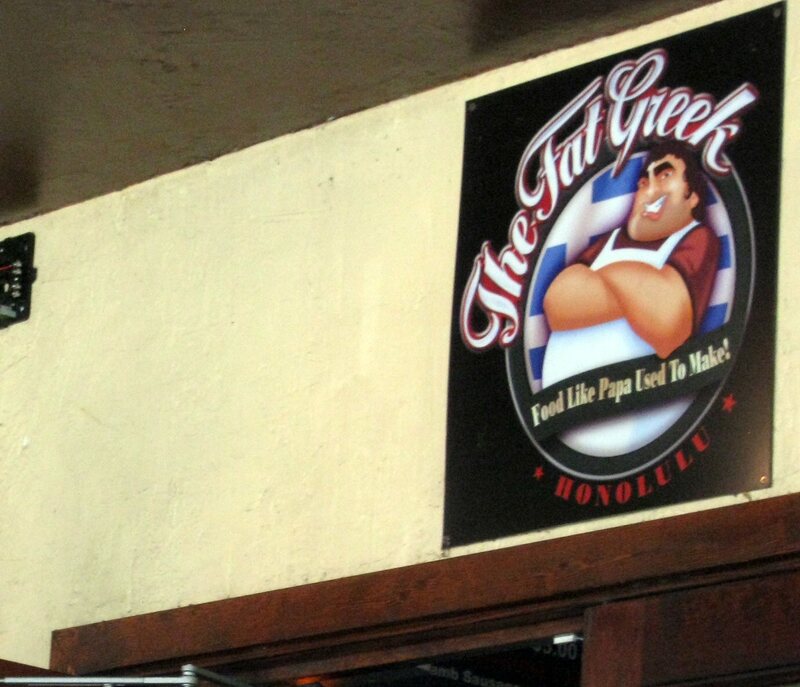 The Fat Greek: just one of the many businesses who has offered a special bargain through Groupon. This is only part of the $25 order from The Fat Greek which, because of Groupon, was only $12. Keeping your eyes peeled can certainly be rewarding. Signing up for the daily e-mail subscription is an easy way to stay in the loop and keep up with the deals, which change daily. There is an old saying that pops into mind: sounds too good to be true. How are such discounts available without it being highway robbery to the businesses involved? Well, that’s where the name comes from – Groupon, group plus coupon. A business is promised a certain amount of buyers. If that certain required number is not hit, the daily deal is canceled with no charge to the buyers. This very reason motivates those who do want a deal to spread the word about it. Share the deal through Facebook status update, a short tweet on Twitter, or simply by word-of-mouth to help meet the minimum quota of customers to secure a deal. Using a personalized referral link to get friends to sign up for Groupon also provides a nice incentive. For every new buyer referred through your link who makes their first purchase, you are credited $10 to spend at Groupon.com. Many college students think it is too large of a hassle to get down to the library, load up a print card, and print the Groupon. Fear not, printerless college friends! Coupons can easily be loaded up onto a mobile application for easy digital access on an iPhone, Android, or Blackberry, or by typing the address touch.groupon.com or m.groupon.com into any mobile web browser. Honolulu is just one of many cities Groupon covers. Since the founding of Groupon in November 2008, it has expanded to include over 500 markets in 44 countries, according to the website. Groupon was created on the idea that humans become naturally inclined to visit places and do things that they are familiar and comfortable with. Often times, it is easier to bypass any tough new decision making and just stick to what is already known to be good. Think about it: everyone knows at least one person who has not gone scuba diving or surfing even though we all reside on an island surrounded by miles and miles of ocean. Because of this mindset–sticking with the familiar–people rarely explore the full realm of unique experiences in their city. “By focusing on one good or service each day, Groupon makes it simple,” states the website’s “About Us” page. The deep discounts entice people to try new things and go places they perhaps wouldn’t have otherwise. The many markets covered also makes Groupon a fantastic money-saving tool for the frugal traveler. A vacation planned about a month or so in advance leaves plenty of time to sign up for the e-mail subscription to a travel destination, and to discover activities, restaurants and even hotels on-the-cheap. A nifty tool worth mentioning is the “buy it for a friend” button. Nobody wants to be known as selfish Sally, and experiences become unforgettable when shared with a friend. After purchase, redemption instructions are sent to the recipient via e-mail. Alternatively, gifting Groupon credit is a quick and easy option for those last-minute gift-givers. The craze is getting bigger and bigger. 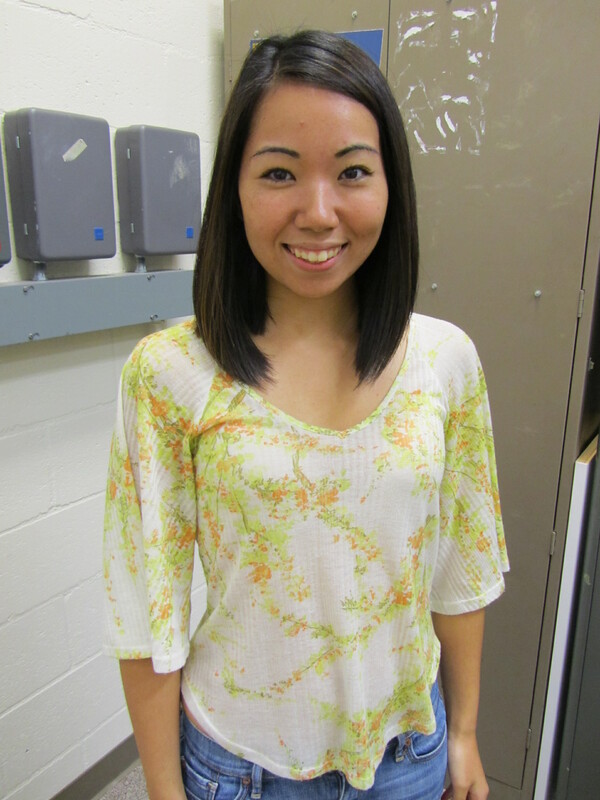 One UH Manoa student who has joined the Groupon craze is Megan Oshiro, a journalism major. She first learned about it through a referral e-mail from a friend. “They had a Nordstrom’s promotion going on. You spend $25, you get $50 worth of store credit,” says Oshiro. A while later, her cousins mentioned that they got a great price on laser hair removal through Groupon, and told Oshiro that it was an 82% discount, a deal too good to pass up. Sure enough, after reading the restrictions and limitations, Oshiro went for and bought one for herself. “Groupon is a free membership. I mean all you have to do is sign up for the e-mail, so you can’t lose anything. It can only benefit you,” states Oshiro. And although it was her first purchase from Groupon, Oshiro says she would definitely recommend it to others. “I think the only catch is kind of sitting and waiting for your deal to come by,” laughs Oshiro. If you have yet to join Groupon, click here to sign up for your own account. In Hawaiʻi alone, 28,000 people wake up each day and drink their morning coffee, unaware that today they could potentially be a killer’s next victim. The killer’s name is diabetes. Of 113,000 diabetics in Hawaiʻi, at least 28,000 are undiagnosed, according to a fact sheet released by the American Diabetes Association (ADA) Hawaiʻi. With complications like heart disease, eye disease and blindness, amputations, kidney disease, coma, and even death, cases of undiagnosed diabetes are ticking time-bombs just waiting to blow. November marks the beginning of American Diabetes Awareness month, a reminder from the ADA to take action against the disease. On the other hand, if the pancreas produces insulin but it is not enough, or not working properly, it is classified as type 2 diabetes. In either case, a lack of insulin intervention allows the blood glucose levels to rise to excessive levels resulting in potentially deadly consequences. While there are symptoms of diabetes, such as excessive thirst and urination, weight loss, and tingling in the extremities, a lot of times the symptoms are completely overlooked. “Most people I talk to say you can’t really tell (when your blood glucose levels are high),” said Dr. Anne Shovic, a professor in the Food Science and Nutrition Department at UH Mānoa. For diagnoses, the Fasting Blood Glucose test is most commonly administered… Click here to continue reading at the Ka Leo O Hawai’i news website! Last-minute Valentine’s Day shoppers had the holiday hubbub made a little less hectic during the “Drive Your Valentine LOCAL” event at Whole Foods Market in Kahala Mall on Saturday, February 12th. Local businesses had stands in every nook and cranny of the store with products to appeal to the gift-giving spirit developed by lovers during the dreamy February holiday. Their products—all from the Hawaiian Islands, 100% local, and made with Aloha—ranged from handcrafted soap to award-winning teas. Perhaps one of the most recognizable lines available during this event were those by Bubble Shack Hawaii, a business founded in 2005 by Holly and Ashley Harding. Frequent Target shoppers may even recall seeing the colorful bath-and-body goods lined up on Target shelves. Bubble Shack offers a wide array of products, including 5-in-1 aloe and shea washes and lotions, body and hair mist, and “big and bubbly Hawaiian soaps”, with a seemingly endless scent list: Coconut Volcano, Pikake Lei, and even Chocolate Malasada! Their products are currently on the shelves at ABC Stores and Target stores across the island, but if you’re hankering for the Lemongrass Rosemary soap, be prepared to make a trip to Kahala Mall, as that scent is exclusively sold at Whole Foods Market. Another business gaining more and more popularity goes by the name of Honey Girl Organics. Primarily composed of organic ingredients made by honey bees, Honey Girl Organics offers a wide variety of all-natural skin care. The honey bees, raised locally at North Shore, provide an abundance of organic beehives in the lush forests of Pupukea. It all began when Anthony Maxfield became a beekeeper of bees already on his Pupukea property. Gwen Maxfield had previously noticed how soft her husband’s hands were from working with honey. After about a year of experimenting with the honey, Anthony came up with a formula that leaves skin feeling soft, smooth, and hydrated. Anthony Maxfield, wife Gwen Maxfield, and friend Christina Sirlin were practicing raw foodism at the time, and they saw a demand for an entirely natural, unprocessed, skin care product, said Sirlin. “All of our products are made from edible ingredients, because we believe that it’s best to put on your body only what you’d be willing to put into your body,” states the Honey Girl Organics website. They started giving the lotions and crèmes as gifts to friends and family and the product began to collect oodles of praise and positive feedback. Recommendations to sell their product began pouring in left and right; it was clear-cut that there was a market for their high-quality skin care products. “We finally got the bug and started selling it here and there and it became really, really popular,” said Sirlin. Thus, in 2005 Honey Girl Organics was born. 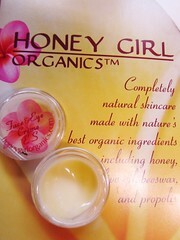 A full list of stores offering Honey Girl Organics can be found at their website: http://www.honeygirlorganics.com. A short walk through Whole Foods Market, a few isles down to be precise, revealed a popsicle stand. These aren’t your typical, sickeningly sweet, artificially colored, melt-in-a-minute popsicles, oh no. These are OnoPops, gourmet popsicles. When the restaurant Josh Lanthier-Welch was working at closed, his brother, Joseph Welch, made an interesting (or, as Lanthier-Welch says, “crazy”) proposition. They could start a gourmet popsicle company. Although Lanthier-Welch initially thought it was absurd, the idea kept creeping into his mind. 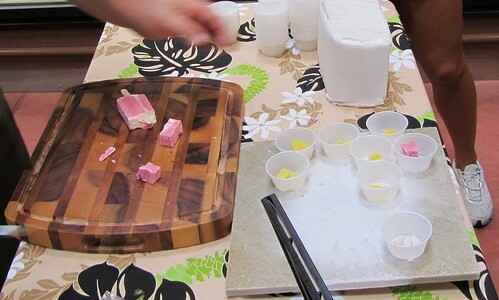 The gourmet popsicle craze was sweeping the mainland and the demand was definitely there. The Punahou graduate realized Hawaii had not yet jumped on the bandwagon. Bring into play the fact that the weather is always some degree of warm, warmer, hot, or sweaty in Hawaii, or “the absence of seasonality,” as Lanthier-Welch more elegantly put it. Anytime is a good time for a popsicle here in island paradise, as already demonstrated by the ever-popular local delight, shave ice! The combination of these two factors was just the push the former restaurant chef needed to take his brother up on the once crazy business proposal. They developed flavors like Dark Chocolate Chinese Five Spice, Kona Latte, Ume-Thai Basil; the most popular being Pineapple Li Hing, said Lanthier-Welch. Not only do OnoPops tout a simple ingredient list free of artificial frills, every one of the ingredients used in OnoPops are local, too. “Raw local Maui Brand cane sugar,” “backyard lilikoi” and “island milk” were among those mentioned to samplers by Lanthier-Welch. The consensus of passersby was consistently along the lines of “Mmm! It’s really good!”, “Yumm!”, or some sort of indistinct sound conveying a state of taste bud heaven. Pleased expressions from one taster would attract many others. These popsicles may be gone in a minute, but certainly not due to melting! He was doling out free samples as fast as he could chop up the little morsels of ice-cold goodness. OnoPops are sold at various retail locations around Oahu and at farmer’s market; a full list of stores can be found at their website. Whether it was love at first sight or a puncture by Cupid’s arrow, the Drive Your Valentine LOCAL event had the perfect love-declaring gift for any shopper’s sweetheart. 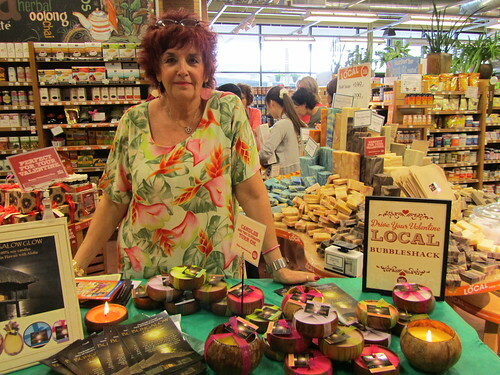 Other vendors set up at Drive Your Valentine LOCAL included ColdFyyre ice cream, Malie Kai Chocolates, Waialua Estate Chocolate, Indigenous Soaps, Hawaiian Natural Tea, The Pacific Place Tea Garden, Waialua Soda and Kaiulani Spices.